What is a thread pack? Glad you asked! A thread pack is a combination of chart and the threads to complete it! They are great take-alongs and make wonderful gifts once stitched. This is a series of three cotton thread packs that combine to make the image you see on the left. 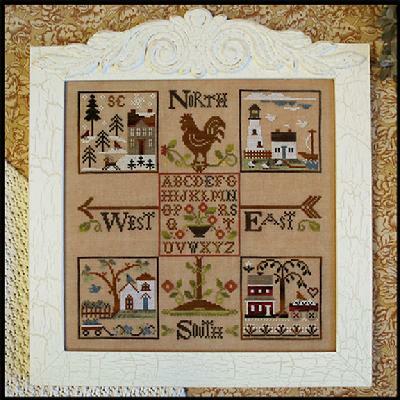 The first pack is the weathervane followed by the North & South pack and lastly, the East & West pack. The model was stitched on 30 count Weeks Dye Works Cocoa linen. These are sold in sets of two. Example: January/February come in one pack.